In my more than 20 years of working with young people from coast to coast to coast, myself and the rest of the Three Things team have been honoured and privileged to meet some amazing, courageous, and energetic youth and young adults. Young people who have had to overcome incredible challenges within their families, systems within which they live, their physical and mental health, and quite often, themselves. Many of these young people have developed programs, opportunities and other avenues to be heard and create change; for themselves and their communities. I have also met young people who, with great support and opportunity, have created action in their communities, schools and their own lives. Wherever I have traveled I have met change makers; many not yet 18 years old! They are creating change in their lives, for their friends and families, and in their communities. Regardless of background, life experience or opportunity young people and the adults who support them all have inherent needs that run deeper than simply their basic needs of food, shelter and clothing. What I have witnessed and experienced, is that they need to know that they matter. They need to understand that they are important. They need to feel that they belong. It’s not relevant whether this young person has grown up in the child protection system, been street involved or been raised in a healthy, safe and supportive environment. They need to know and to believe the 3 Things: I matter, I am important and I belong. Many of our team, from the founding partners to our new consultants know the young person who initially inspired #the3Things and maintained a close relationship with him. We have been close with other young people who had adopted #the3Things and were passing it along to their friends and family. We have the same core beliefs around the role of young people in our lives and communities and how we can continue to learn so much from them. Together we believe the 3 Things as they apply to us, and we want to continue to share them you. So for the last couple years Pytor would tell me these things and I would say them to myself everyday! And it helped me through so much! And one day I said to Pytor that he matters! He is important! And he belongs! And I guess that helped kick on his vision for Three Things Consulting. I felt so amazed when he first told me about it. Especially that I had even the slightest part in it. And for me it was huge! YOU MATTER. YOU ARE IMPORTANT. YOU BELONG…Those three words can change your life drastically! 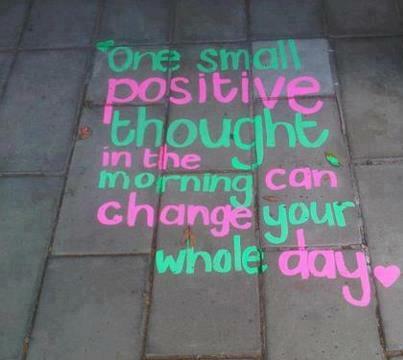 If you really believe in these things it will change you in a huge way. A great way I hope these three things change all of you as much as it changed and helped me. 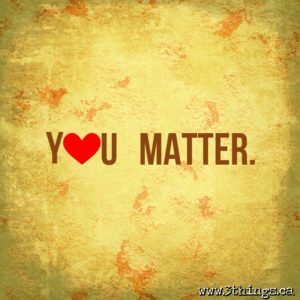 Thank you, and please remember, YOU DO MATTER! 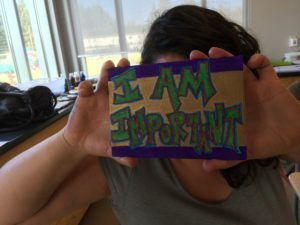 YOU ARE IMPORTANT! 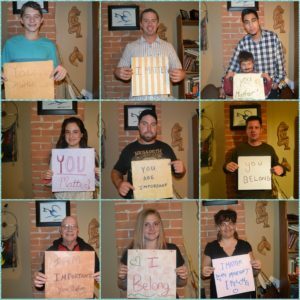 YOU DO BELONG! The 3 Things became clear to me working with one particular young man. For that I will always be grateful. It is a daily reminder to me how much we can all learn from youth or others we serve and support, when we develop relationships that are inherently reciprocal. This particular young man I watched, as he faced challenges in school, with his siblings, and in his community. I didn’t see him frequently; maybe once or twice a year. Each time our paths crossed I was concerned for what his future held. Challenges aside he could have been on a poster for what meaningful engagement can do for a young person…especially in the short term of a young person’s life. In our interactions he was involved with a national youth serving organization and attending youth conferences. This organization, then and now, creates powerful events where a transformation occurred for many youth, including this young man. At one particular event when he was 14 years old he was asked to be in a leadership role. This young person had never been in such a role: adults in his life treated him as a recipient of a program or service, and many of these adults in fact questioned why he was asked. He quite often took serious risks and would find himself making unhealthy choices in his life. “Leader” was not a word that would have been used to describe him by many adults. Thankfully several organizations and adult allies were able to see through the various masks he wore and recognized what he truly was – a leader in hiding. At this event the young man simply shined. He was a role model for younger youth and a motivator for older youth. Though nervous and shy and not always the strongest at facilitation, he held his own and he asked for help when he needed it. He flew through the week with a trail of other young people following behind and taking his lead by participating, getting engaged and taking on leadership roles themselves. He intervened and supported youth who were homesick. He helped make sure younger youth participated. He bravely led group activities. A team of people had his back and continually pumped him up, providing to him the necessary support to succeed. When facing self doubt he was able to talk about it, get feedback and direction and carry on with his work. He was a youth facilitator and he carried that title with pride and demonstrated what it looked like for others. As the week drew to a close this young man and I, who had already known each other for several years, had a chance to debrief. I heard him share about what the week meant to him in his heart and soul. He talked about feelings he had never felt and though he couldn’t quite name them, he knew they were powerful. While listening to him, what became clear was that he felt, and most importantly in that moment, believed he mattered. He mattered to the youth he supported along with the adults and the other young people at the conference. He realized that what he did and how he did it mattered. Listening, encouraging and engaging other kids, being respectful, participating. It all mattered. It meant other kids, who like him at previous events might have been shy, nervous or disengaged, shared in his life changing experience of learning important things: They mattered, and they felt it. He felt it. You could see it on his face, in his eyes, and in his posture. You could hear it in his voice and feel it radiate from him. He mattered. Simple. He talked about the role he played and how honoured and proud he felt to be part of something like this conference. As he had never been asked to be in a leadership role he hadn’t thought of himself in this way. When asked to be a facilitator he was told that his life experiences and the challenges he had overcome would help him support other young people with similar paths. Throughout the week, putting that idea into practice, it sparked something in him in his core: that he was important. His life experiences, even the challenging ones, they were important. How he presented himself, role modeled healthy behaviours and shared with others; it was important. Learning this and experiencing it was critical for this young man to finally appreciate that he was important. Lastly he spoke about how he felt being surrounded by people who were supporting him and cared about him. He tried to explain that this feeling hadn’t occurred in school, home, or in local organizations he was involved with. He didn’t know what the feeling was, but that it meant he felt good about himself, safe, and a part of something. He knew, from being in a supportive community that was developed over the course of one week, that he was welcomed and people wanted him there. He realized that he belonged. Talking with the young man had me realize these 3 Things: he mattered, he was important and he belongs. These were not only new feelings but critical to a successful transition into adulthood. He couldn’t simply feel it at that moment. When he returned home, to school and to his community, it needed to be maintained. I realized that what he had felt is what so many young people in my 20 years of working with children and youth have been searching for. In fact, isn’t that what we’re all looking for, to know and believe these 3 Things? I knew he needed to keep feeling and begin to believe in the 3 Things. Like so many other things in our lives believing these 3 Things would take practice. I encouraged him to repeat each of the 3 Things five times out loud: I matter. I matter. I matter. I matter. I matter. Quiet and awkward at first, he became much louder each time. Notably uncomfortable saying it out loud, I watched and listened as he made his way through the 3 Things. After the fifth and final ‘I belong’, I knew at that moment he genuinely believed this to be true. I encouraged him when he returned home (even if it was privately in front of the mirror with a sink running so no one would hear them) to repeat those 3 Things five times each morning. The simplicity of it amazed me. Like so many other lessons in our lives for us to really learn and understand something, it takes practice. This young man showed me over the years what could come and how this practice could lead to powerful results. Now almost a decade later, hanging in this young man’s house wall are two powerful examples of what’s possible: a framed poster with the 3 Things as a daily reminder, and even more wonderful, his high school diploma. When he graduated at 16 years old he defied odds and showed the world who he really was. He has since joined the Armed Forces and is walking a good road in his life. Through this time I have shared #the3Things with many youth and adults in my life. What has happened since has been magical. I have encouraged them to practice using #the3Things in their lives. Leading keynote presentations I have had thousands of young people (and adults) repeat after me: I matter, I am important, and I belong. I began hearing stories of these people sharing it with others in their lives; other youth, siblings and co-workers. I have walked into schools and youth organizations and seen #the3Things hanging on a wall as a reminder to everyone. I also learned, from these young people, that the same applies to me: both #the3Things and my need to practice them. Like many others I have moments of self-doubt and fear; I’m human. So are you. 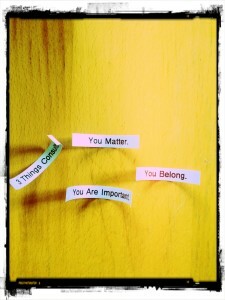 #the3Things help remind me that I matter, I am important, and I belong. So you know, the same goes for you.